I hope that you are well - thank you as always for kind wallpaper comments. With old houses you never really finish decorating and I now realise that this house will never be 'done' - just a process of refinement (sort of). Talking of refinement I am desparado to clear some 'stuff'' and the spare bedroom is rapido filling up with my 'reading rid of' section - mind you when I wistfully see very similar 'stuff' appearing on blogs I have great pangs of regret - daft as it is only STUFF. So these are my Christmas cards - these ones are sort of home made! They all feature Christmas things from our home.... there is a bit to choose from.... here you can see photographs of paper bunting that I have made, our old table runner, old tins, old Christmas magazines, old tablecloths, old decorations, one of the wreaths that I have made from old stuff..... All sorts that I think look purdy for Christmas. These are pricey I think (our printer is not up to printing these out so have to sent away to be done) so not a cheapo (sorry a bit of Italian creeping in - I just cannot help myself nowadays!) Christmas card option. Some of these things merit a little posting all of their own ...one in particular is my favourite thing...which one is it do you think? This afternoon I am launching my brand new shop called 'The Custards Christmas Cards' (TCCC) for a unique line in cards this season...ho ho. The other option is so use up old stock that has not been used before and I will be posting about that next time! PS I have been invited to apply for a little job in Jersey - I haven't been there for years but do still have some things that I bought whilst there - anyone know if Jersey is rich in vintage goodies? That might be the deal breaker!!!! PPS Apologies for 'genderism' on previous post - thank you once again to The Hattatts for appropriate reminder. A breako from the packing!! 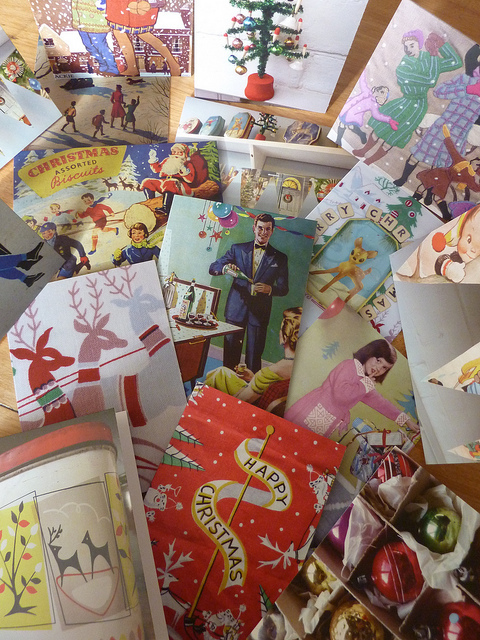 At one time we received somewhere over 200 Christmas cards each year and sent about half that number. About three years ago we stopped sending any and hey presto [good expression in the Italian mode] we now receive perhaps two!! We mind not at all. Now, we really are off to get the Eurolines bus!! Oh Jenny, how lovely! I love the lady with the snowball best, I think, but they're all lovely. Pity I don't send them though, stopped about 8 years ago as it was just one more thing to get stressy about and each year I give to a different charity instead. Much easier, and not completely bah! humbug!! Oh now look!! - So weird you did a card post today because today is The Day I Start My Card-Making and bien sur I am going to do a blog post about it. You have read my mind. Your cards are cracking. Very nostalgic and retro. And I don't know which is your favourite thing...maybe the glittery doll card? Dear wendz - looking forward to seeing your cards much indeedy. Far better to send with sincerity than 'just because'. The glittery doll I keep meaning to 'dress up' and then forget all about it! More to come of favourite! Indeed Bee - one or two less each year....soon there will be next to none I think. I like to send cards and use old ones to cut up and make things for myself :) love your cards, they are wonderful! Indeed - lots of uses for old cards - making more cards being one of them! Good choices Lucey- the Quality Street one is actually a very large needlepoint that sits in the spare bedroom! I like the festive stamps too - I have a little post lined up about those! Looking forward to seeing your wire 'hangy thing'! Wish that my writing was nice! My favourite card is the baubly wreath one - love it. Aww thank you Barbara - I made those wreaths a couple of years ago - a glue gun works wonders! Thank you for the info about the Channel Islands..I may be 'forced' to apply now! We do like a bargain! I dont send as many cards as I used to do but when I do I make sure they show the nativity because I am obsessed that people are forgetting what christmas is all about. Anyone I see on a regular basis doesnt get one, they are sent to people who I dont see with a little note inside.At work we tend to make donations to charity in lieu of cards, a much better idea and it saves having to write the blooming things too! 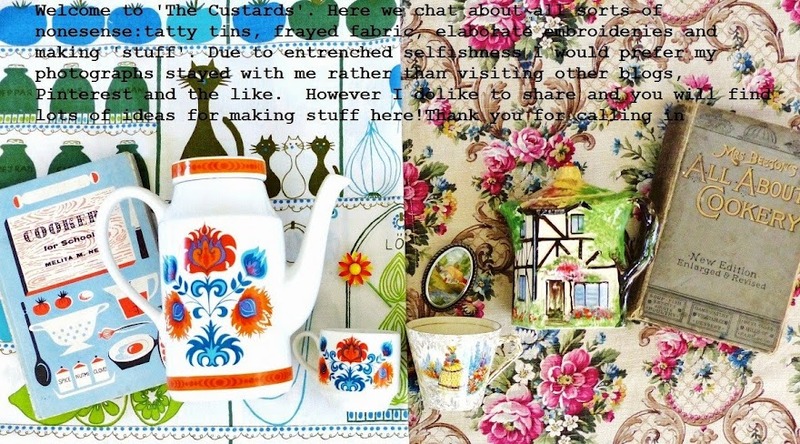 Hi Jenny, this is a fab idea and I love all the designs, most of all the vintage lady wearing a head scarf, just lovely! Echoing every one else on this one, sending less and donating more is a much more stress free and giving thing to do. Ooh haven't watched 'The Paradise' yet as been a busy bee this week, but now you have me excited about the last episode, can't wait!! Cards are great for a bit of recycling aren't they Thea - keep meaning to make one of the hexagon ball thingys! Hi Jenny,LOVE your Christmas cards and the idea that you have a Christmas cupboard!I do think we ought to send and buy cards because there must be people who are in the card business and depend on us to buy them to keep them in their job,just as we depend on others to keep us in our jobs! I do think that the post office should make a special cheaper stamp for Christmas cards as 12 shillings is a vast amount for one little stamp and we could buy all of our Christmas dinner for that much! !God bless the postie though for delivering in all weathers.Sorry to have gone on there,my favourite card is the wreath and bunting one.Warm Regards Pam. Love your retro cards! Cards were a dilemma but... for many years now I only ever buy cards direct from the charity or maker... or I make them myself. That way I am supporting either creative endeavour or others in need... Conscience clear I send my love and greetings freely. Good idea Cass - were are guilt ridden don't you think! Christmas cards - option 3 and blog loss!! Christmas card - option 2 - sub option! 100 things to do with a blank wall...number one..